The utility room is a room in the house that is used for storage of equipment and other appliances that are not frequently used. Utility rooms are usually also placed near the laundry area or washing machine. It is also often used for storing of shoes, coats and other cleaning materials. Utility room should not be neglected in terms of interior decoration; it also needs to be clean, organized and pleasant looking. If you leave a utility room in full view then it might affect the interior design and beauty of your home since it will appear messy and full of clutter. One of the best solution for this is to use a foldable or folding door to cover the whole area of your utility room. 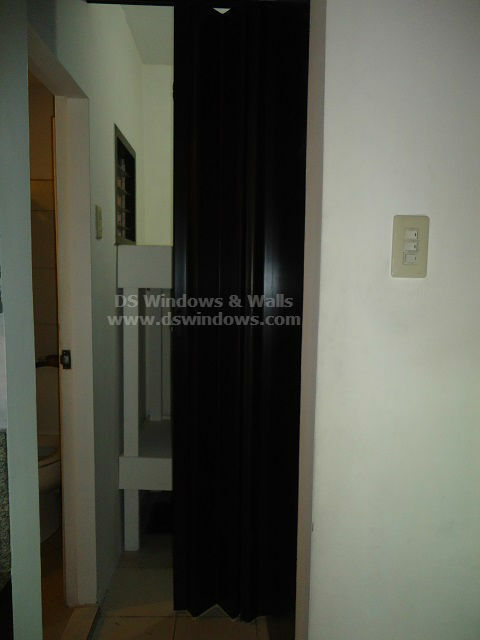 Just like our clients from Lipa City Batangas, in order to hide the unpleasant view from their utility room, they opted for PVC accordion door. It also serves to set the space between their toilet room and utility room. Our client’s main reason in buying a PVC accordion door is to prevent people, especially their visitors to view or to sneak in their utility room whenever they will use their toilet room. They chose wood color for their PVC accordion door to match with their kitchen cabinet and wooden doors. Our PVC accordion doors are custom made based on your desired width and height. PVC accordion door can be a decorative element, it can give your space elegance. More specifically for reference our client opted regular type of PVC accordion door and selected wengue color. 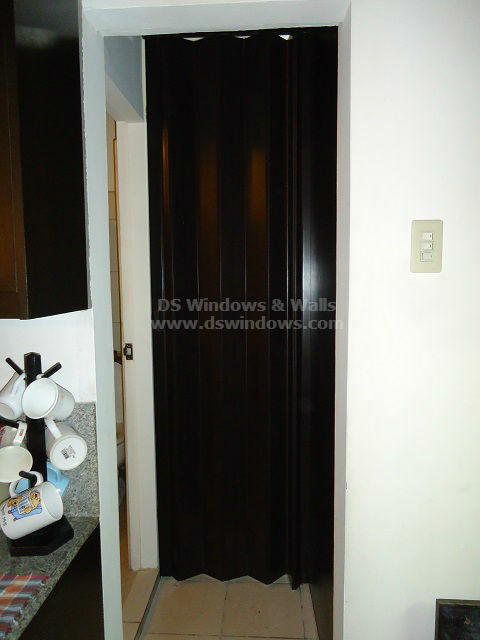 DS Windows and Walls Interior Supply provides high quality, functional and attractive PVC accordion doors. For Lipa City Batangas area you may contact the following numbers: Globe 0917-583-0214 or Sun 0922-592-6111 or 0908-989-4676 – look for Patrick Villapando. You may also visit our shop located at 4th level Waltermart, Makati City, 3rd level Robinson Metro East, Pasig City and 2nd level Pacific Mall, Lucena City. Or you can visit our webstore at www.angryblinds.com.ph. For rough quotation you may email us at inquiry@dswindows.com or call us at (02) 403-3262 / (02) 668-9668 / (02) 893-1373 and 0916-311-3909.